A tramline along Schmidtovskiy Proyezd was constructed and started regular service in 1931, bringing life to this previously blighted factory district. 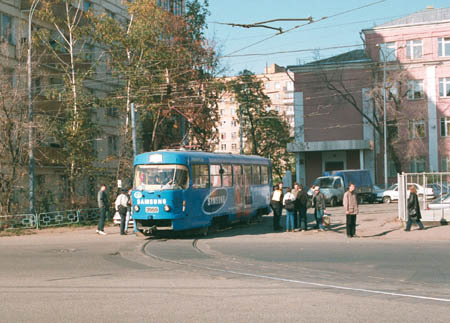 The line saw many a decade of heavy tram traffic, enforced by a trolleybus line in 1961. Unfortunately for the tram, the street it run in (while all the line remained in the central alignment with mixed traffic) became too congested by the end of 1990s, and trams often got stuck here - sometimes even for a few hours! The doomsday was inevitable, and finally this line was closed down in 2000, after 69 years of service. The main reason of closure lay in the planned construction of the third ring highway and necessity to make way for a motorcar traffic during the construction phase in Sergey Makeev Street - but this was impossible without removing tram tracks. Additionally, the road builders have widened Zvenigorodskoye Shosse, another street along route 23, and even the faintest possibility of tram return got reduced to dust. 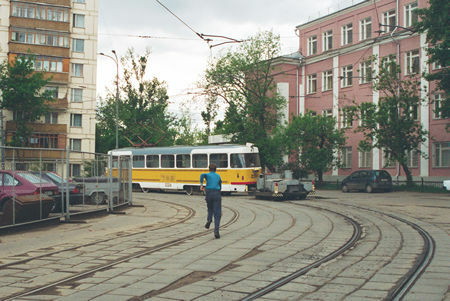 Thus, in 2000 route 23 was shortened to a new reversing loop built in Vagankovo, not far from Krasnopresnenskoye tram depot. But this was not the final cut for this route. In 2002, the road workers approached Begovaya Street, and the street also lay along tram route 23! 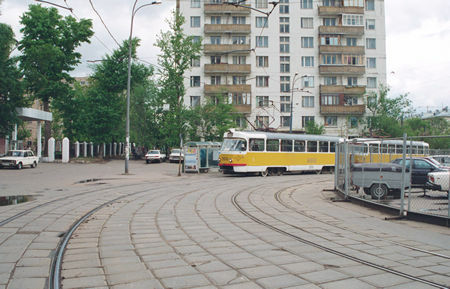 On 26 May 2002 the route was cut again, now to a new reversing loop in Botkinskiy Proyezd. Were it not for a mass protest campain, the closure could be essentialy more dramatic - the whole line along Leningradskiy Prospekt was ready to be sacrificed, but suddenly the Powers That Be agreed to build a new terminus. It could sound funny if it were not serious, but this closure also appeared not to be the last one! The next step was taken on 25 December 2004, when suddenly the previously mentioned line along Leningradskiy Prospekt was abandoned because of construction works on a new highway intersection. The long-suffering route 23 got shortened to the loop in Alabyana Street, a few hundred strides from Sokol metro station. Now the officials prefer to keep silence answering the queries regarding when or whether the line in Leningradskiy Prospekt would resume tram service. We are waiting for the end of 2005, as the construction works are to be completed by then. The following set of pages presents some views of the gone part of route 23. Tracks are long uprooted, some places are even difficult to recognize today although not so many years have passed, but memories still remain. So, let us begin our walk along the tracks from the former terminus in Schmidtovskiy Proyezd. A two-car train on route 23 at the terminus. The loop had two tracks, however the second track was not used regularly. 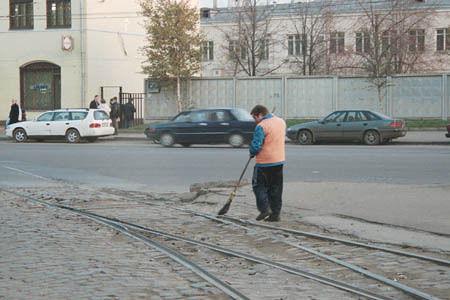 A track cleaner at the terminus removes rubbish and dust from the rail grooves. 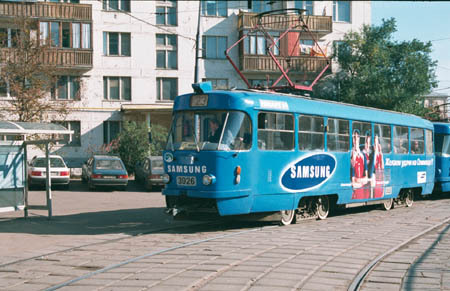 The tram is departing for its long trip on route 23 towards Mikhalkovo in the north-west of Moscow. A view of the terminus tracks. One track is used by regular route trams, and the other one is reserved for special occasions. There is also a mirror installed on a pole near the tramstop, it helps a driver have a better view of all train's doors. A track maintenance worker is cleaning rails of the turnout. Just ten days later the line would be abandoned for good.